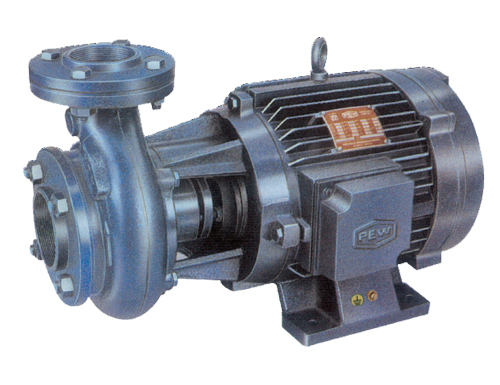 "PEW" End Suction Pumps are non- self-priming single-stage, centrifugal volute pumps with axial suction port, centrally placed radial discharge port and horizontal shaft. Volute chamber and impellers are designed to give the best possible hydraulic efficiency and good suction lift characteristics. Most modern and highly sophisticated machinery and technology are engaged in manufacturing these pumpsets, using quality raw materials, dynamically balanced impellers and rotors to ensure long life. These pumpsets are powered by a totally enclosed, fan cooled, AC Induction, two pole motor suitable for continuous duty with main dimensions complying with IEC standards. Motor stator is made of low watt-loss, silicon steel laminations assembled under pressure and rigidly locked in the frame. The windings are of high-grade enamelled copper wire and are varnish impregnated. Construction of motor frames and usage of quality materials result in high performance and low temperature rise thereby increasing the life cycle of the pumps. Single shaft for motor and pump ensures good mechanical strength. Dynamically balanced rotating parts such as impeller and rotor. Bronze impeller available on request. Graphite coated asbestos packing rope is used to increase bush life. 32 x 25, 40 x 40, 50 x 40, 50 x 50, 65 x 50, 65 x 65, 80 x 65, 80 x 80. Single Phase: 230V, 50Hz, A.C. Supply Incorporated with Thermal over load protector.